Impromptus represent Davie's first foray into the etching technique and reflect his dazzling, spontaneous imagination. Forms and symbols are conjured out of Davie's unconscious and often allude to the religious and the sexual. Fleeting thoughts are captured in gestural marks on paper. He describes his approach to drawing as a method of 'unintentionalism'. This spontaneity is reflected in the series as a whole. Etching, sugar-lift for black, flat aquatint for ochre and spitbite for red and green, printed on 310 gsm Somerset Tp paper. From a portfolio of 16 etchings published by The Paragon Press in 2003. Alan Davie (born September 28, 1920 in Grangemouth, Scotland died 2014) studied at Edinburgh College of Art in the late 1930s. 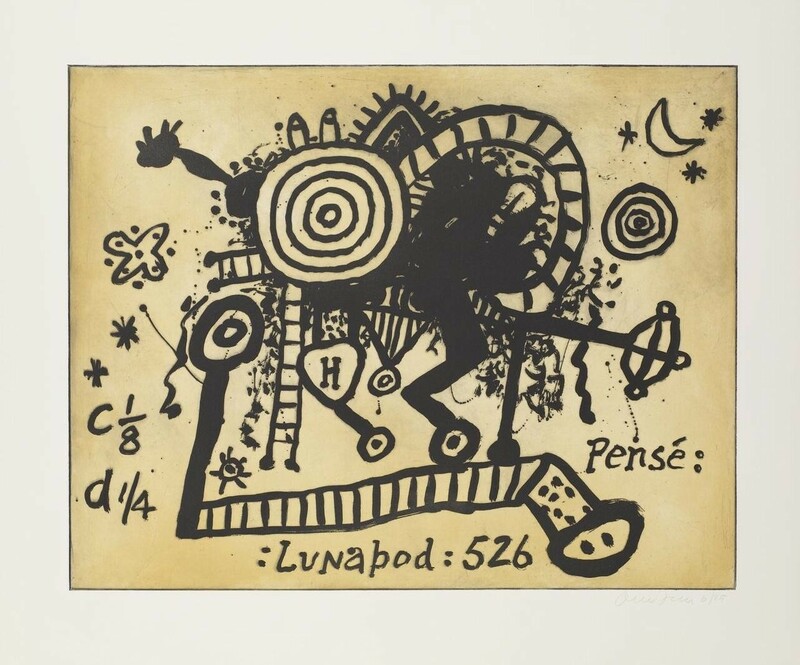 In the post-war period he found himself greatly influenced by the ‘automatic’ techniques practised by the Surrealists in Europe and ‘action painters’ such as Jackson Pollock in the US as a way of releasing creativity hidden within. Davie draws from a wide range of sources ranging from Indian mythology, Zen Buddhism and African tribal sculpture to Australian Aboriginal art.